In November 1999, I was on my way home from work in my stock '71 FJ40 with stock F engine, and some joker pulled in front of me and I had to stand on the brakes to avoid putting my bumper up his a$$. At that moment, a nasty knocking sound started coming from my engine. Traffic was heavy, and there was no opportunity to pull over and investigate. I got home, and opened up the hood and listened. There was no drop off in power while driving home, or change in oil pressure on the gauge or change in engine operating temperature. The knock didn't get louder or quiter depending on the load or RPMs, it just followed the RPMs in frequency. I drove to and from work the next day, knock is the same as ever. I knew it couldn't be healthy, and enlisted the aid of my fellow cruiserheads on the Land Cruiser Mailing List. I also asked my fellow club members in the Rising Sun 4WD Club, and most either recommended Joe Calleja at Colorado Toyota Specialists, who I had already called, and was booked out three weeks solid, or suggested that my engine was ruined and I needed an overhaul. I did bring in a tech from Automotive MDs, who did a diagnostic and ruled out "rod knock", and a number of other nasty things that would indeed mean that my motor was shot. One of the keys is that when you disconnected the spark plug wires one by one, the knock sounded the same. 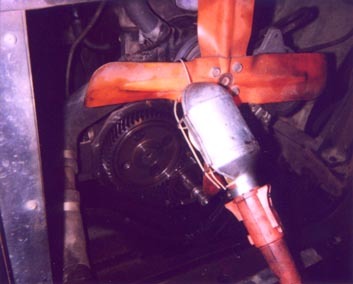 If it were a rod bearing, it would have gotten quieter when the plug wire was disconnected from that cylinder. 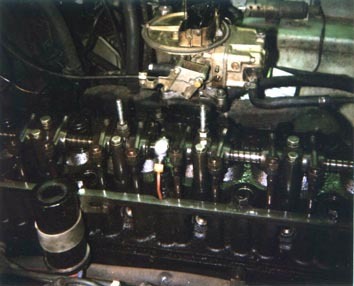 One of the first things I did was to pull the valve cover and check the valve clearances. They are supposed to be .008" on the intake and .014" on the exhaust. Earlier in this writup I had said that my F engine was stock. Well, it does have the Holley 350cfm carb on it. Bt that's the ONLY thing that isn't totally stock on this cruiser, besides the front bumper. I also did a good visual examination, and could find nothing obviously wrong. That silver looking thing with the copper tubing attached in the middle of the rocker arm shaft apparently is some kind of oiler thingie, and it doesn't look stock. None of the valve clearances were way off, although I did tweak them up, it didn't make any difference in the knocking sound. 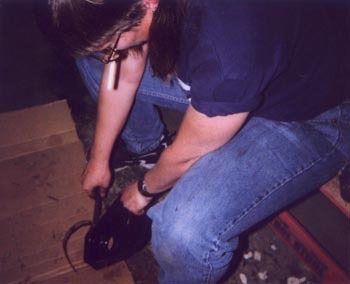 Next I dropped the oil pan, and spent several hours getting 10W-30 dripped into my hair and face. I even got some gunga in my eyes, even though I always wear safety glasses. Thrust clearances were all within spec, and nothing was obviosly loose, bound up or otherwise visually wrong with the bottom end. I then found a piece of metal in the botom of the oil pan. It was part of a round washer-looking thing, about 60° worth, maybe an inch and a quarter diameter. I crawled back under the engine and continued my search. That's when I found what looked like something that didn't belong. Holding the light just right, I was able to look through the oil galley in the front main bearing and see a piece of metal up in the timing gear area. I used a needle nose pliers to try to get it out, and ended up pushing it up in there out of sight. I knew nothing should be that loose in there, and that I was on to something. I fashioned a hook out of some coat hanger wire and fished out two more pieces of this washer looking thingie. After fishing and fishing, I guess I got everything out of there that I could, so I put the oil pan back on. That was a bit of a PITA, but I got it back on and proceeded to look at these pieces of metal that I had recovered from deep in the bowels of my engine. My Haynes manual didn't show what they could be, and it wasn't until the next day when I was looking at an exploded view in a Man-A-Fre catalog that I saw my culprit. The Cam Gear Retaining clip. The trick to getting this nut off is to set the breaker bar on the frame rail, then tap the starter (in neutral of course! ), and it breaks it free. This method works like a charm. To retighten it, it takes 140 foot-pounds, not for the faint of heart! Note that in this photo, I have the breaker bar resting against the wrong side of the frame!!! It should be on the driver's side when you tap the starter! You don't have to remove the fan from the water pump pully for this job. Thank goodness for small miracles! 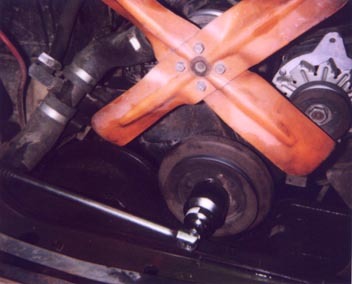 Once you get the nut off, you then have to use the harmonic balancer puller to get the crank pulley off. It's fairly straightforward, but time consuming. Once you get the crank pulley off, then you can remove the timing cover bolts. Be very careful which bolts go where, as they are different lengths, and if put back in in the wrong order can cause all kinds of problems! This next photo is of the cam timing gear itself. You can see that there is no retaining clip holding it on. Well, those are the main points. I had never done this job before, but with the help of fellow listers, it was completed and I was able to drive in the foot and a half of snow that fell the next day. The engine still knocks a bit, but at least I know why now. In the process of losing that clip, a piece apparently got chewed up in one of the teeth of the cam gears. We didn't have a new one that night, and needed to get it buttoned up that night. I have since ordered a new one in from Specter, along with new gaskets and seals. When I get done with the Restoration of the '76, I'll go back in there and replace the cam gear with the new one.